Boston Tea Party or Renaissance might be regular classroom lectures in Kashmir, but its own native movements hardly find any mention in history books. Progressive Writers Movement of Kashmir was one such historic event, now reduced to a faint idea of halcyon days, amid the self-indulgent contemporary literary practices in Kashmir. Even as wastelands of Europe stood out in a macabre splendour after shadows of World War-II drifted away decisively from the Western horizons and far away from the sprawling theatre of war, tectonic changes were taking place in Kashmir, then plagued by years of serfdom and travails of landless peasants under the Dogra regime. It was preparing to set the stage for a new movement to unfold itself that, through its literary forays, would attempt to render an altogether new shape to the socio-political spaces of Kashmir. This movement, which was famously known as Progressive Writers’ Movement (PWM), was thoroughly anti-imperialistic and left-oriented in its nature. For quite many years, this movement held an unshakable sway over the writers in the Vale and survived its politically charged and shaky environs. It was inspired from the 1935 London Conference, attended by intellectuals and writers from the Indian sub-continent including Faiz Ahmad Faiz, Sajjad Zaheer among others. 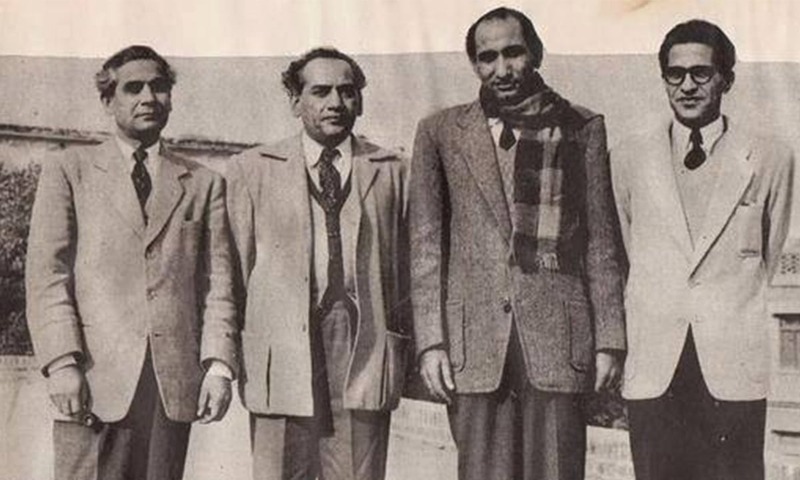 Progressive writers (left to right) Sibte Hasan, Faiz Ahmed Faiz, Hameed Akhtar. With revolutionary thoughts swirling in their minds, they had decided to establish a Progressive Writers’ Association with an aim to end centuries of imperialism and feudalism. During those epochal times, turbulent as they were, political landscape of Kashmir was also heavily battered with years of Dogra rule and subjugation which had ultimately given way to the popular anti-Dogra movement in Kashmir. Years of indentured serfdom had made Kashmir an alluring prospect for any movement that would bring with itself an unmistakable promise of liberty from seemingly perennial yoke of persecution. “Those who had attended London Conference also contacted and met writers here in Srinagar among whom were Abdul Ahad Azad, Ghulam Ahmad Mahjoor and Dina Nath Nadim who later became the founding members of this movement in Kashmir,” Khayal shares his insights about the forgotten movement. This writer’s association, in Kashmir, came into being in and around 1947, with Ghulam Muhammad Sadiq, the influential political leader of Kashmir at that time, as its first patron. “As this movement proceeded, more writers and people joined this caravan among whom, today, only three members are living – Rehman Rahi, Kishore and me,” Khayal says. With its ideological roots anchored in communism, Progressive Writers’ Movement used literature to stir an intellectual debate, for serving the purposes of life, says Rashid Maqbool, a well-known Kashmiri poet-academician. It then propelled the thoughts that art had to be used to create social and political awareness among the people. “And the wave, which was generated from communism, made its way into English, French, Urdu and then Kashmiri literature as well,” Maqbool continues. Even as this movement proceeded many jumped the bandwagon because being part of that movement would earn you an intellectual title and recognition. It became a trend at that period of time. PWM’s office address was at Srinagar’s exhibition ground, where from its members would travel extensively to villages where they held poetic symposiums and cultural programmes in Kashmiri language to deliver evocative messages about the state of affairs in Kashmir, says Zareef A. Zareef, a popular Kashmiri poet. The focus, as Zareef explains, was clearly on the awakening of the oppressed Kashmiris — then grappling with multitude of problems. But soon as Bakshi Ghulam Muhammad emerged as New Delhi’s new installed head of the state during the fifties, the crackdown against PWM and its activities began. Since then, Kashmir has not witnessed any such literary movement with similar intensity and verve. Bashir reckons that communism or the leftist movement in India is stale. There’s nothing new coming from Pakistan or Russia, therefore nothing can be expected in Kashmir and shouldn’t be expected given the fallacies of communism, the author-academician reckons. But poet Zareef offers an entirely different explanation. “Our behaviour today is teeming with flippancy toward everything and we keep foraging ways that might help gain lucrative benefits for our individual self and not for the nation as a whole,” he laments.